Julius Caesar, the famous dictator, was assassinated in 44 B.C. on the “Ides” of March. We’ve all heard of the Ides—but what exactly were they, and what made them so ominous? Common sense doesn’t rule our daily lives; culture and habit do. Proof lies in the Roman method of describing calendar dates. You could not make this more unreasonable if you tried. Every month had an Ides (Idus in Latin), signifying a day (although, to complicate things, the noun is plural) in the middle of the month…sort of. In the longest months—in the calendar that Caesar reformed only a few years before his death—there were 31 days in March, May, July, and October, and the Ides fell on the 15th. In all the other (shorter) months, the Ides fell on the 13th. And it gets worse; that’s not even touching on the Kalends, the Nones, and an impossible system of counting back from fixed days. For example, the day after the Ides of March, the 16th, was expressed as “17 days before the first day of April.” (Why 17? Because both March 16 and April 1 are included in the count.) This dating system is the bane of Latin students everywhere. The Wikipedia entry on the Roman calendar isn’t bad, if you can follow it. At any rate, the Ides per se were not all that special, but they got a lot of attention after Caesar’s assassination. Despite Caesar’s fame, the only reason most of us have heard of the “Ides of March” (now that everybody doesn’t have to read Latin) is that Shakespeare made them famous in his play Julius Caesar. In real life, did anyone ever really say to Julius Caesar, “Beware the Ides of March?” Not exactly. Roman sources such as Suetonius, Plutarch, Cicero, and Valerius Maximus report that an Etruscan soothsayer named Spurinna warned Caesar about danger on (or leading up to and including) the Ides. Plutarch’s Lives of the Noble Grecians and Romans, published in translation in 1579, was especially popular. The text was first translated from Greek into French, and then by Thomas North into English, so the ancient text was a bit diluted by the time it influenced Shakespeare. 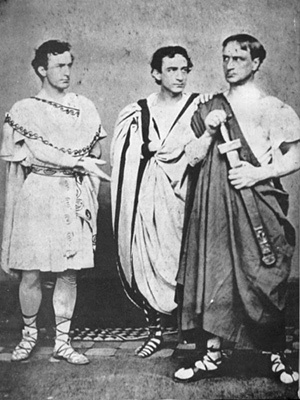 Interesting aside: in 1864, John Wilkes Booth, Lincoln’s assassin, acted with his brothers in a performance of Shakespeare’s Julius Caesar in New York. It was probably Shakespeare’s decision to turn Spurinna into a mysterious figure in a crowd—issuing a clipped command about the Ides, in a loud shrill voice—that kept the term active (Act I, Scene II). How Did the Soothsayer Know? How did the soothsayer Spurinna know the Ides would be a bad day for Caesar? Roman soothsayers were in the business of checking out omens and portents in order to identify lucky and unlucky times for private and public activities. This particular seer is identified in ancient sources as an haruspex, one who could assess the good or bad implications of the entrails of sacrificial animals. The name Spurinna is Etruscan, and Etruscans were known for their skills with guts. 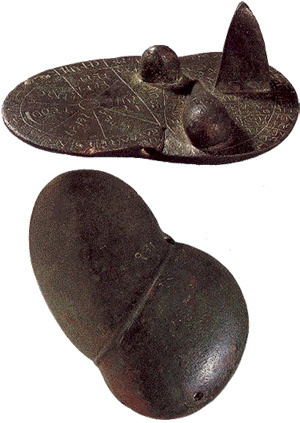 This life-sized Etruscan bronze sheep’s liver unearthed in Italy in the 1870s probably served as a training tool for seers; it is divided into regions, possibly reflecting the heavens, inscribed with the names of gods. Livers and other organs were read for signs of divine approval or disapproval. Discoloration, defect, oozing, bad smell, failure to burn properly, and many other clues provided indications of divine ill will, and different regions of an organ might point the interpreter in different, usually bad, directions. However, the details of this once-essential practice are now mostly lost. Haruspices also paid attention to strange animal behavior and unusual weather. But since, according to the Roman historian Suetonius, Spurinna warned Caesar while the seer was performing a sacrifice, presumably there was something defective in the organs of the unlucky animal. Around this same time, at a sacrifice conducted by Caesar (perhaps on the very day of his assassination, or on the occasion when he first sat in public in a kingly purple robe), the sacrificial ox was missing its heart—a terrible sign! Furthermore, during a sacrifice the next day, his sacrificial victim was missing part of its liver (says Cicero in On Divination 1.119). Of course, although a sacrificial victim with a disgusting or missing organ was taken very seriously, there were also plenty of opportunities to twist interpretations for political or personal reasons. Why Didn’t Caesar Beware the Ides? 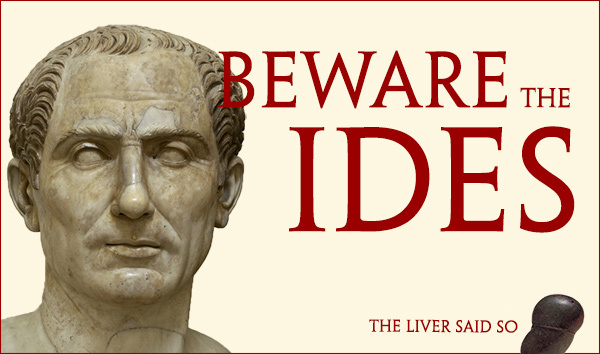 In hindsight it might seem a bit odd for Caesar to have disregarded the warning about the Ides, but the dictator had in fact discounted many a divine warning before, including plenty of bad news about the Ides…keeping in mind that many of the reported omens probably came later, with hindsight. He followed protocol, but often didn’t believe in, or just thought he was above, the negative messages from the gods. One bad sign did worry him. The night before the Ides, his wife had a dream about his bloody murder that upset them both. This delayed his attending the Senate the fateful morning of his death, but his friend Decimus Brutus—confusingly, not his more famous, deceitful friend Marcus Brutus—ridiculed seers and dreams and talked him into coming to the meeting place (Plutarch, 64.2–5). There he was stabbed 23 times (Plutarch, 66). As Caesar entered the Senate, he supposedly said to Spurinna, “You realize the Ides have come?” (As in, “How good a seer are you?”) Spurinna’s reply: “You realize they have not yet gone?” (As in, “Just wait!”) That swift retort, more dramatic in the ancient sources than the third-person statements of warning, also survives in Shakespeare (Act III, Scene I), but is not as famous. It would be appropriate to muse on the Ides of March during a visit to the Getty Villa, inspired by the Villa dei Papiri at Herculaneum—very possibly the getaway villa of Julius Caesar’s father-in-law, Lucius Calpurnius Piso. 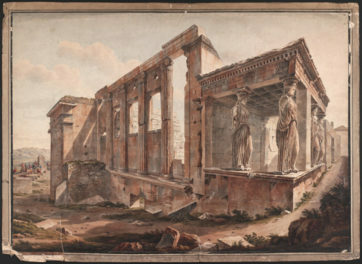 The villa was buried during the eruption of Mount Vesuvius in A.D. 79, and its ground plan inspired J. Paul Getty when he commissioned the original Getty Museum. Perhaps even visit the Villa on the Ides…if you dare. Valerius Maximus, Nine Books of Memorable Deeds and Sayings, 8.11.2. Here’s an English translation.